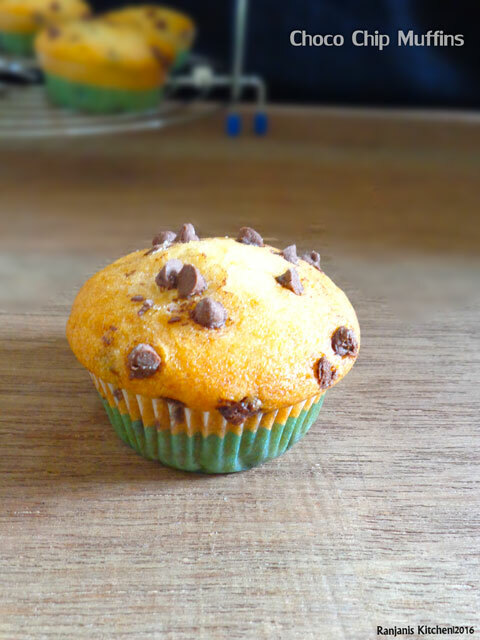 Chocolate Chip Muffins or Chocolate chip Cupcakes – Easy and quick method of making eggless cupcakes. Presence of curd gives wonderful raise on these muffins. These Moist and fluffy muffins with a cup of strong coffee is a perfect way to start your day. I added ¾ cup of sugar as I added sweetened choco chips. So adjust sugar accordingly as of your taste. No need to add any icing for these cupcakes. 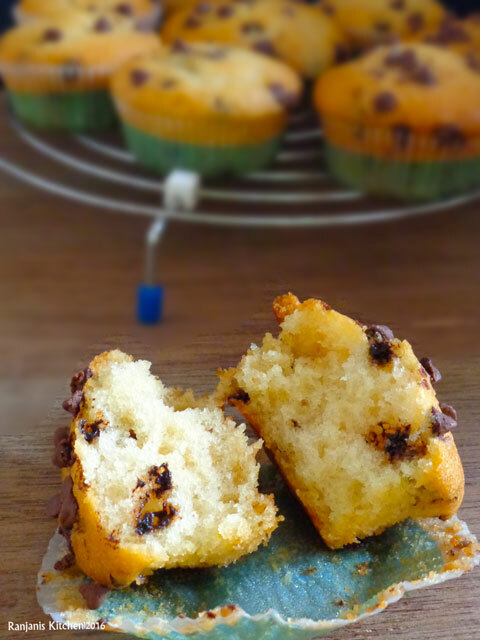 Chewy choco chips are enough to enjoy this cake. 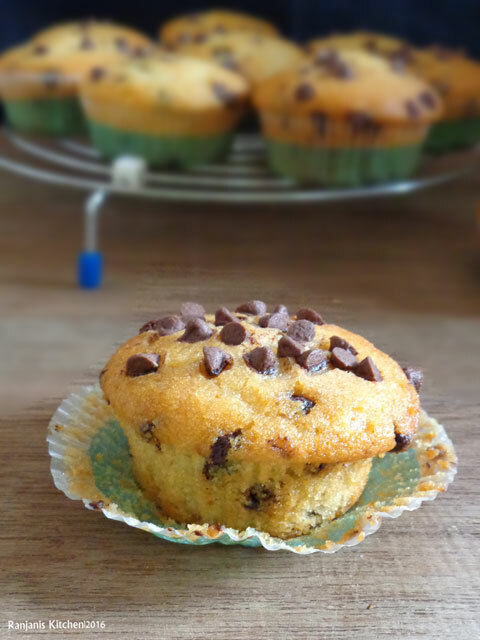 Check out how to make chocolate chip muffins. Dust choco chips with flour in a bowl. Pre-heat oven for 10 mins at 18 degrees. In a mixing bowl, add curd,oil, sugar and vanilla essence. Whisk well till the sugar completely dissolves. Add baking powder and baking soda and give a mix. Now add the flour in two shifts and whisk to mix well without lumps. Finally add flour dusted chocolate chips in the batter. Reserve a tbsp. 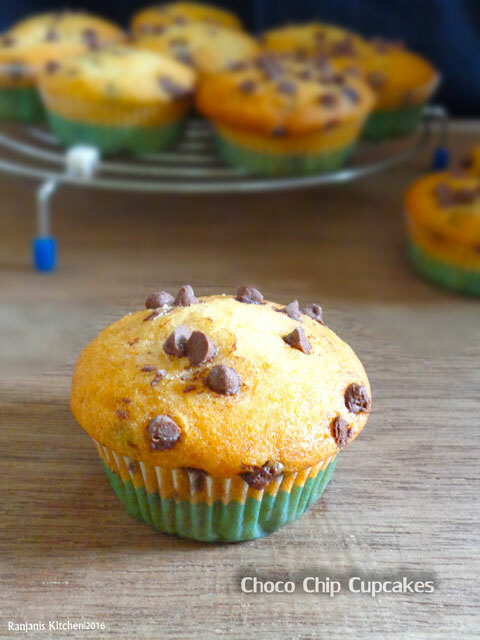 of choco chips to sprinkle on top of muffins. In a muffin tray,place muffin liners, pour 2 scoops or ¾ level of batter on each cup. Bake in pre-heated oven for 20 to 25 mins. Remove and check in centre using tooth pick. If it comes out clean, the cupcakes are done. Cool the cakes completely in a wire rack and serve. We can use same level of softened butter instead of oil. Increase or decrease chocolate chips level as for your taste. Hi, can yogurt be replaced with something else?